CCleaner is one of the most popular and free computer cleaning software on the Internet. This program removes cookies, temporary files, browsing history, download history, log files, Recycle Bin, Recent Documents and so much more. This helps with computer privacy especially if you are on a shared computer. It also aids in cleaning your computer of unneeded files and garbage that can slow down your computer by freeing up hard drive space. I use CCleaner after I surf the Internet and it really seems to keep my Internet Browser running quickly since it deletes cookies, temporary Internet files, and information from login forms that I really don’t need on to be saved on my computer. CCleaner has an option to cookies on your PC that you may want to keep like your login information for services as your Comcast login, Gmail, Google accounts, AOL, Yahoo Mail, Hotmail and other login websites. This is done by the Intelligent Cookie Scan feature. You don’t have to enable or use this feature but it is available if it makes it easier for you to keep these cookies. This CCleaner free version supports the cleaning of all major Internet Browsers such as Internet Explorer, Firefox, Google Chrome, Opera, Safari, SeaMonkey and others. Other tools and features that CCleaner includes are a Registry cleaner, System Restore point’s cleaner, ability to enable or disable start-up programs, duplicate file finder, and program uninstaller. I do use the Startup tool. This works just as MSConfig does on Microsoft Windows. I always see an improvement in my booting time and my overall system performance when I disable programs that I don’t need to start up with my computer or run while using my computer. Just use some caution when you disabling programs since there are some programs that are essential to keep enabled. The option to clean out Windows System Restore points can also free a lot of hard drive space. CCleaner does not allow the last restore point to be deleted for safety reasons. If you really need to delete all of your restore points you would need to do it manually through the Microsoft Windows restore point settings. I’ve been using CCleaner for a long time now and mainly use it to delete left over data and files from surfing the Web. Part of this is for privacy purposes but it is also to keep my hard drive clean of unneeded files. Although a registry cleaner is included, I do not regularly use registry cleaners. I do however use the included registry cleaner tool if I am cleaning up a computer that had a virus or some sort of malware. 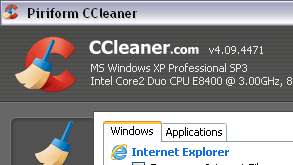 This is official CCleaner slim version that is the same as the regular version except it does not include the toolbar. CCleaner (Piriform) was kind enough to make this slim version available. This makes me like and respect this company even more than I already do.